There is a ditch crossing the fairway which may come into play on either your first or second shot. 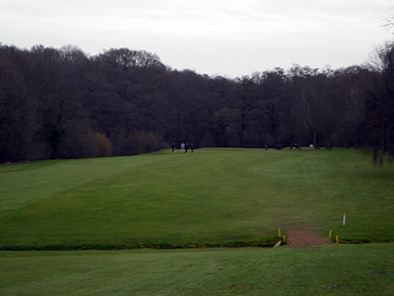 You cannot see the ditch from the tee or from some points in the rough or on the fairway. It is, therefore, sometimes hard to see if your ball has gone in the ditch or not. This ditch has yellow stakes. If you opt to take a penalty drop from it, you must drop it from the side it entered the ditch. The boundary of the ditch is marked by the yellow stakes. Sometimes it goes over the ditch and yellow stakes then rolls back in. •Play another ball from the point you hit the ball into the ditch. If this is the tee, you will be playing stroke three. If your second ball went in the ditch, you will be playing four (rule 20-5). •Drop a ball outside the hazard behind the point where the ball last entered it. Imagine a line extending back from the flagstick to the point your ball crossed the margin of the hazard. Now imagine that line continuing to travel straight back for hundreds of yards. This is the line you must drop on. You can go as far back as you like. There is a one stroke penalty (rule 26-1b). 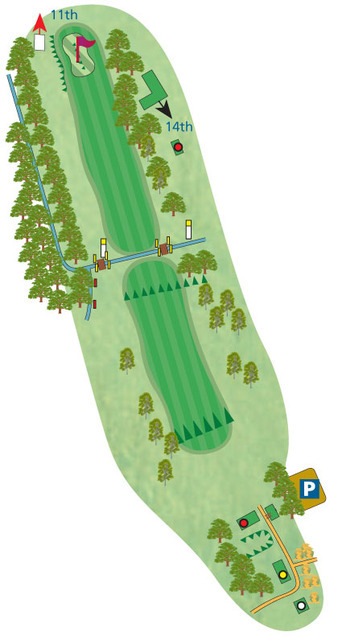 Note; lateral water hazards (marked with red stakes) allow you to drop within two club lengths, no nearer the hole. If you or your playing partners saw the ball entering the ditch, you can opt to drop a new ball under penalty. If you did not see the ball enter the ditch, this is more problematic. You have to be at least ‘virtually certain’ it entered the ditch (rule 26-1). This is sometimes the case on this hole. When your ball hits the middle of the fairway and rolls down the slope you usually cannot see it enter the ditch. The area surrounding the ditch is very clear. It is likely you would find your ball if it was either short of or just over the ditch. So, if your ball hits the main part of the fairway and is then lost, you can be ‘virtually certain’ it has entered the ditch. You can then drop a new ball under penalty at the point you think it may have entered the ditch. from the place you played your last shot (rule 20-5).